Why do employees become disengaged and why does it matter? Employee engagement training is imperative for keeping your employees on track, building competence, and helping them increase productivity. Research has shown that developing and implementing a career plan is one of the core ways of keeping them ready to perform and even increase performance. But what if you invest in training your star players and they use their new skill set to walk out your door and find their next job? The benefits of an engaged workforce are indisputable, which is why increasing engagement with employee engagement training is an essential component of the Employee Development Systems, Inc., mission and is integrated into all of our curricula. 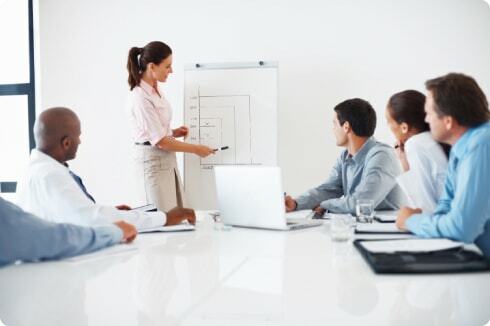 Our results–oriented training courses improve workplace productivity, effectiveness, and performance for leaders, managers, and front-line employees. Accountability goes hand-in-hand with engagement, and is one of the most powerful tools in increasing personal effectiveness and improving professional presence. Our programs focus on helping attendees become aware of how accountability plays an important role in their personal and professional success, and the personal growth that takes place when self-accountability is a top priority. The bad news is that engagement levels of US workers is low, with only 30% actively engaged. Another 50% are not engaged, and even worse, 20% are actively disengaged. The cost of disengagement is staggering. The good news is that significant cost savings can be realized by developing a productive, engaged workforce through employee engagement training. The top 25% of productive, engaged workers have 50% fewer accidents, 41% less quality issues, and overall lower healthcare costs. Employee Development Systems, Inc. (EDSI) provides programs in Increasing Personal Effectiveness®, Professional Presence in a Casual World, Communicating to Manage Performance, Leading with Credibility, and others that directly address employee engagement and at every level of an organization. We have been resolving employee development, leadership, generational, professional presence, and personal effectiveness issues for over 30 years. Contact us to learn how we can help increase productivity and profits in your organization. 800-282-3374.